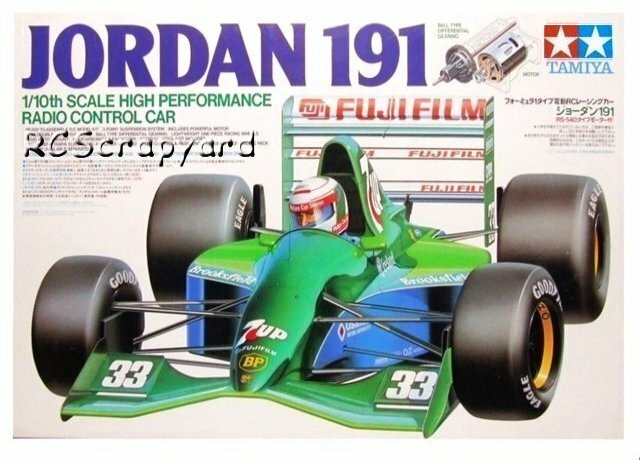 58103 • Tamiya Jordan 191 • F101 • (Radio Controlled Model Archive) • RCScrapyard. Released by Tamiya on November 12, 1992, was the Jordan 191, with the Ford Cosworth V8 engine, that raced in the 1991 Formula One world Championships, driven by five different drivers that season, including Michael Schumacher for his first ever F1 race … qualifying an impressive 7th, but retiring on the first lap of the race. This was the last Tamiya model to be based on the F101 chassis that incorporated a ball differential in place of the old orbital gear type. 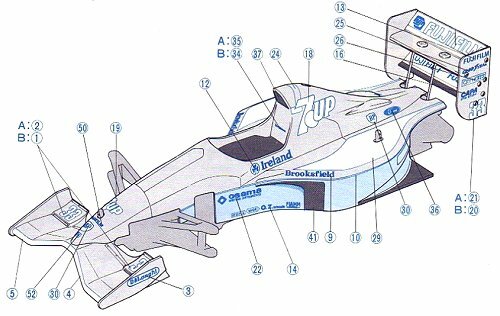 A huge leap forward in F1 model design at the time. To drive, the F101 was a vast improvement over all the previous Tamiya F1 and F2 chassis designs. With a few tweaks including thicker shock oil and a stronger coil spring the car was precise on cornering and very stable accelerating out of corners. For collectors of Formula One cars, display quality and NIB examples of the Jordan 191 are often available.